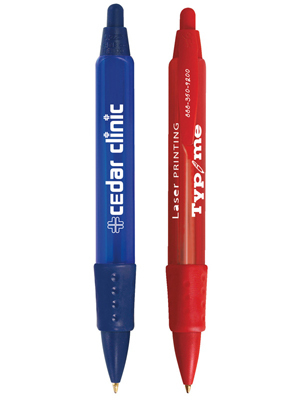 Pen Color : Choose from the selection shown. Imprint Area: 2 1/4" x 5/16"
White is recommended on translucent color barrels. Dark colors are recommended on clear barrel. Packaging: Standard 15 lbs. (approx.) @ 500 per carton. Special packaging (click here).